I've talked about my Venetian mirror obsession before, but it has been a year or so and I felt it was time to rekindle the love. I first spotted a Venetian mirror in Domino: The Book of Decorating and from there the love affair began. As with many popular design elements, the key here is balance. 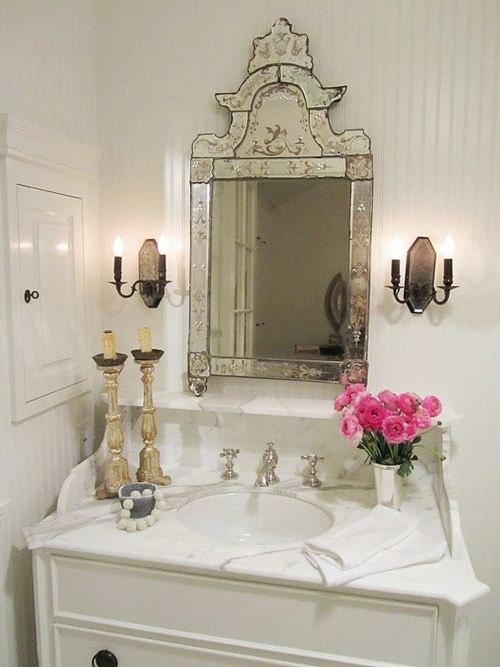 The glamorous details of the mirror can become excessive if paired with other mirrored furniture, a la Lisa Vanderpump. But when balanced with softer, non-mirrored elements, the effect is understated glamour in all its perfection. 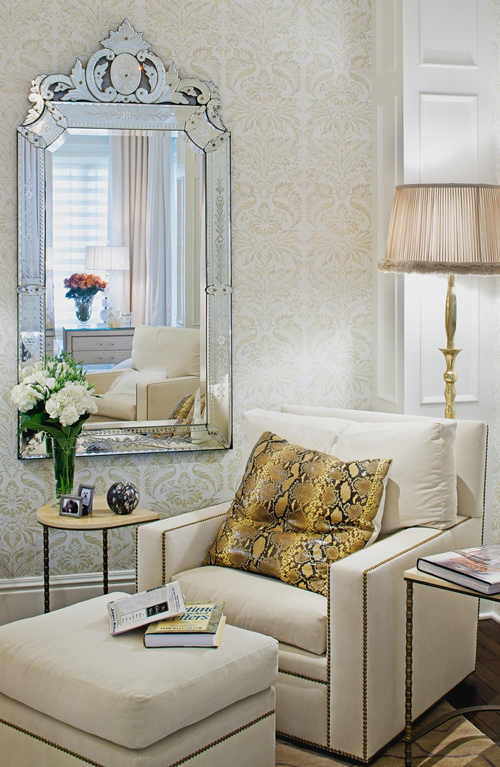 What's your take on Venetian mirrors? P.S.- I posted about a few of my favorite ways to spruce up your home for spring on Fetch This. Check out the post here! I absolutely love them as well! I love their intricacy and glamour, but you are right that balancing them out with less shiny elements is key! Me too! I'm a fan! So beautiful and really add so much to a space...but I agree it has to be done properly. Off to check up on your guest post. Love the Meredith Heron glass on glass. Gorgeous! I want that first one please! They are so gorgeous. I love them. LOVE these mirrors! I was able to score one that I have above my fireplace for $99 at Homegoods because of a tiny chip on the very bottom. Not even noticeable. It probably gets the most compliments out of anything in our house. Couldn't agree more! Such a statement piece! Agreed, I have to have one! 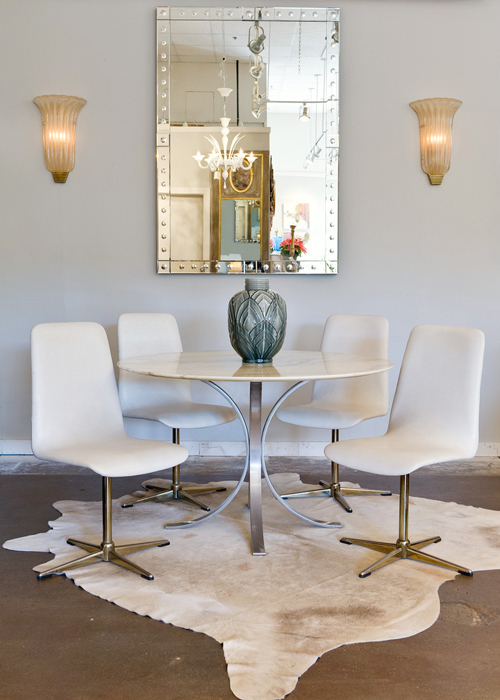 I love the vintage look and a mirror is such a great way to make a space look larger. I've been dating one at Restoration Hardware for almost a year now. Maybe one day we will actually commit. I'm in deep, mad love. I am so obsessed with these as well! Swoon! Love these! I have a vintage mirror tray that I found a while back and I LOVE it. 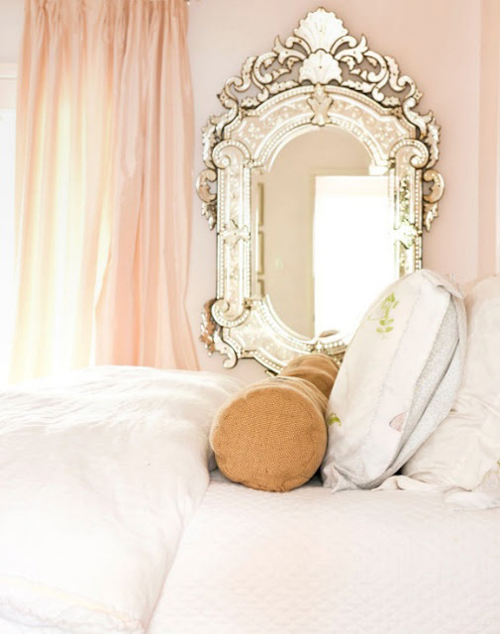 It ignited my love for mirrors as a decor item. Definitely thinking that a venetian mirror is a great next purchase! Wow! All of them are gorgeous! They look so pretty with marble! Such a classic and elegant look…. I'm in love too! Yes this IS a nice added treat for the home. I love the look. Especially for a glamorous bathroom! The second and third rooms are two of my favorites!! 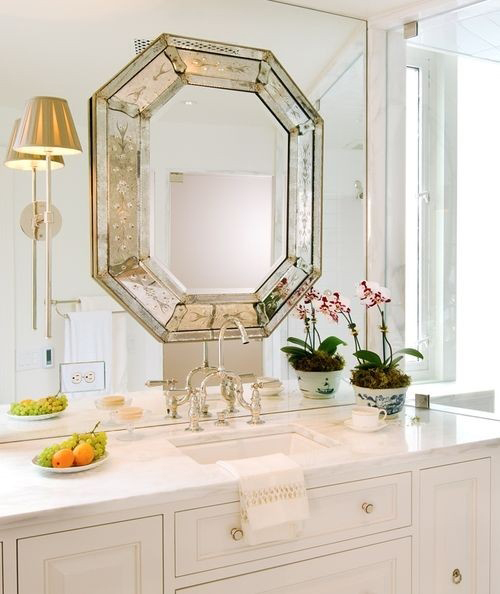 I am dying for a venetian mirror too! I love it, so beautiful and in the morning with the sunlight is looks like a jewel or a diamond with all the reflections on the many facets! Hi Samantha, love your blog! They have some really nice things and the decoration are made with Murano glass !